On hindsight, it's not shocking that Jr. Walker and the All Stars, unlike most musicians at Motown, succeeded so mightily and visibly. The company needed some outlet for the boiling guts beneath its artists' gleaming mainstream facades! Walker was either born Autry DeWalt II or re-christened such following an earlier name, Oscar G. Mixon, on June 14, 1931. Although he mastered the crawl and the toddle, "Junior Walker" got that moniker not from frequent roaming but from his father, Roosevelt Walker. Still, after his family moved from Blytheville, Arkansas to South Bend, Indiana, people started noticing his special rhythms. In his new home, he could pursue his lifelong specialty: music. With his trusty tenor saxophone, Junior Walker blew through high school and nearby R&B and jazz clubs with the Jumping Jacks. Yet he wasn't so focused on a straight-ahead path that he couldn't stop and appreciate others' talents, including those of organist Fred Patton and, later, blues guitarist Willie Woods. After the rotating door of sidemen got its first spin, Junior Walker took the lead and served as the axis of what would become his signature band. Having gigged in upper Indiana and lower Michigan, Walker settled down in the latter state. Late-1950s Battle Creek was the birthplace of what would officially be known as Jr. Walker and the All Stars: Woods, organist Vic Thomas, and Tony Washington on drums. Here comes the inevitable Hitsville connection! Singer Johnny Bristol watched Jr. Walker and the All Stars during an El Grotto club performance. After wiping the sizzling grease off his brow, he told pal Harvey Fuqua about the band. In 1961, Harvey the label hired the squealing saxophonist and his rip-roaring rhythm section. Records like "Cleo's Mood" established their promise before Motown acquired Harvey's roster and, in 1964, the band, which still featured Woods, Thomas, and Washington with Walker. Jack Douglas, then James Graves, later took Washington's drum seat. It was the 1965 lineup of Walker, Thomas, Graves, and Woods that rode "Shotgun" to the top of the charts. If Junior Walker had thought he could foresee his professional course, then Motown had found a way to catch him off guard. A vocalist's no-show for "Shotgun" had forced horn man Walker to lay the vocal track. To his bewilderment, Motown had kept it. Whether he wanted it or not, the country would know him as singer-saxophonist Junior Walker. Nonetheless, soul-selling was a good thing for Jr. Walker and the All Stars. They stuck to their forte--R&B instrumentals--and made some noise with originals like "Shake and Fingerpop" as well as in-house covers like "How Sweet It Is (to Be Loved by You)." (For the band's mainly Motown discography, click here.) Graves went lickety-split in '66. Hits like "(I'm a) Road Runner" kept the group running on high-octane fuel. After a series of boogie-able party tunes, it was, perhaps, time to dribble syrup into the frying pan. Doesn't sound appealing? Junior Walker wasn't enthused about the ballad "What Does It Take (to Win Your Love)" himself. Though he'd continued to insert vocals on his records, he didn't want to really, you know, carry a sweet tune! Producers Bristol and Fuqua prevailed in the studio, as did Jr. Walker and the All Stars on the charts. As far as Top 5ers went, that 1969 song and their first Motown hit were poles apart. Pieces like "Gotta Hold on to This Feeling" and "Hip City, Pt. 1" and "Pt. 2" maintained their stylistic seesaw. The band had gotten a late start at Motown compared to other acts. But that didn't delay its fading Pop-ularity in the 1970s. Thankfully, the R&B market hadn't shrugged it off. 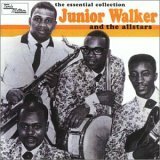 And regardless of commercial clout, Jr. Walker and the All Stars' raucous soul influenced many grateful funkmeisters that decade. In the mid-to-late '70s, Junior Walker tried his horn at solo works with producer Brian Holland (Hot Shot), and then on Norman Whitfield's self-named label (Back Street Boogie). Still, by 1981, the world had found other musical idols. That year heralded another unexpected turn. A band he didn't know from a genre he hadn't tried convinced him to guest-play on one of its songs. So, after one listen and with one take, he did. That improvised solo, during the refrain of Foreigner's "Urgent," was so outstanding that it brought Walker a new concert standard as well as a nice fee. As if he really did Blow the House Down at Motown, that 1983 album signified the end of Junior Walker's recording days. So what did he do for the next decade? What he did second-best (if singing didn't count): He walked, or rather, roamed the globe, touring with his All Stars or his own junior, Autry DeWalt III, on drums. Those were the '80s and '90s. Part of the latter, anyway: Cancer struck Junior Walker in 1993. Reportedly, as time went on, he had trouble with not only performing, but also walking. On November 23, 1995, the disease extinguished the All Stars' leading light. Walker's side men have kept the party going. Death has taken key members, like James Graves as early as 1967, and Willie Woods 30 years later from lung cancer. But surviving Motown originals Thomas and Washington and musicians like saxophonist Kenny Walker and percussionist Acklee King have known not to give it up as part of "Jr Walkers Allstar Band" (note the official, legal name without some punctuation). The singing--of praises--has continued with the group's 2002 induction into the Grammy Hall of Fame for "Shotgun." Silence is especially disturbing if the music that once filled it was so lively. So go ahead, pop in and turn up that Jr. Walker and the All Stars record. No surprises, no new twists. Just some of the most pleasurably blistering foot-stompers on this end of the soul griddle. In the mood for more Motown oldies articles after this Jr. Walker and the All Stars biography? Go home and scan 'em 'fore you run, now!